Debitize is a simple but shrewd app that enables credit cards to act like debit cards. By linking your credit card purchases to your bank account, Debitize helps you take advantage of rewards cards while avoiding debt and building your credit score. Learn more here. As somebody who despises debt, talking about credit cards is always a slippery slope. On one hand, I never want to encourage those struggling with debt to rack up more. I firmly believe debt is the biggest obstacle standing between you and the life of your dreams. On the other hand, credit card rewards are a fantastic tool for designing a lifestyle you love. Heck, we use credit cards all the time, making sure to pay them off several times a month. Doing so means we never carry a balance, we never get charged interest, and we take full advantage of all that points and miles cards offer. We’ve used these points to travel the world for pennies on the dollar, so there’s obviously a place for the responsible use of credit cards inside your lifestyle plan. So, what’s a travel-loving debt warrior like me supposed to recommend? For years, I’ve struggle with finding a solution, but I think I’ve finally discovered one. It’s called Debitize, and I absolutely love the concept. Debitize is a simple but shrewd app that enables credit cards to act like debit cards. By linking your credit card purchases to your bank account, Debitize helps you take advantage of rewards cards while avoiding debt and building your credit score. Frankly, I think it’s brilliant and wish I’d have thought of it myself. Create a free Debitize account here. Connect your credit cards and bank account to the app. Use your credit cards as you normally would. 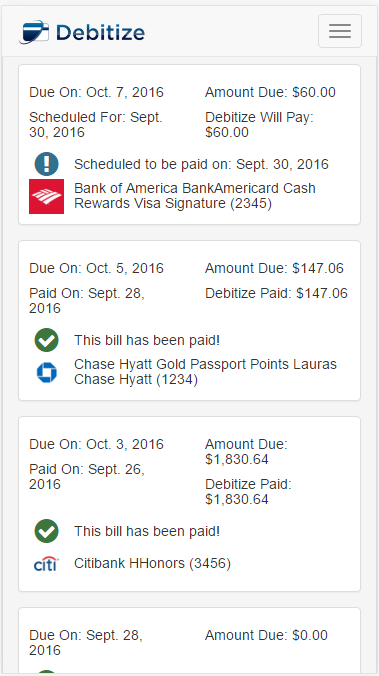 Debitize automatically uses the money in your reserve account to pay your credit card bills about a week before they’re due. So, why wouldn’t you just use cash or a debit card instead? I’m glad you asked! Here are a few reasons Debitize may be a better fit. Travel Rewards – For our purposes, the best thing about Debitize is that you can take advantage of credit card rewards – particularly travel rewards – without worrying too much about debt. By deducting credit card transactions directly from your bank account, Debitize helps ensure that you’re not spending more than you have. It’s the perfect way for would-be travelers to earn valuable travel rewards while staying debt-free. 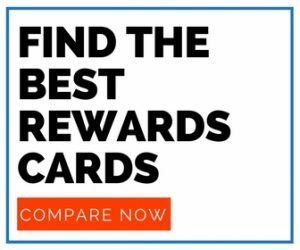 Cash Back Rewards – Don’t have use for travel rewards? Debitize is great for cash back cards too. Simply connect your cards to your account, and earn cash back without overspending. Improved Credit Score – I have my issues with how credit scores are viewed and used, but there’s no denying that a good credit score is important for a variety of reasons. Two of the biggest factors for determining your score are your payment history and credit utilization. Debitize helps improve your score by ensuring your bills are paid on time (payment history) and in full (reducing your utilization). Expense Controls – If you’re concerned about debt, Debitize is a great fit. Once connected, Debitize will never allow your bank balance to drop below the minimum amount you specify. This ensures you won’t charge more than you have. Automatic Payments – With Debitize, you never have to worry about being late with credit card payments. The app automatically pays your balances about a week before they’re due. Fraud and Other Credit Card Protections – Credit cards come with protections against fraud that debit cards do not. For instance, with a credit card, you’re only liable for a maximum of $50 in fraudulent charges. With debit cards, you’re liable for up to $50, $500, or all of the fraudulent charges – depending on how long it takes you to report the fraud. Certain credit cards even provide additional benefits like primary auto insurance coverage on rentals, extended warranties, and more. Free Accounts – Using Debitize is completely free. There are no hidden fees or charges. Plus, as a thank you for registering through Club Thrifty, you’ll get $10 credit toward your next credit card bill when using the link below. Get a $10 Bonus! – For being a Club Thrifty reader, Debitize is giving you a $1o credit toward your next credit card bill! Sign up for a FREE account and claim your $10 bonus here! Debitize is still relatively new, but I love how committed they are to helping people avoid credit card debt. Here’s an example: In March 2017, they rolled out a new feature called the “Debt Destroyer.” This added bonus helps you pay off your existing balances faster while avoiding future credit card debt. To keep your current purchases in the black, connect your accounts and use Debitize normally. Then, tell Debitize to pay an additional amount toward any existing credit card debt you have. 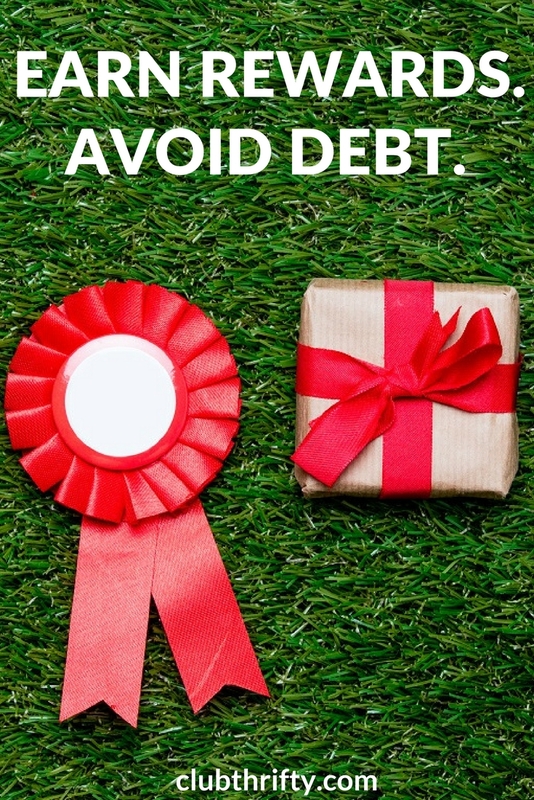 It’s a simple but effective way to pay down your credit card debt for good. And since the payments are made automatically, you can set it and forget it. OK, so let’s look at an example of Debitize in action. Suppose you make a purchase with a connected card for $147.06. You then use a second connected card to make a purchase for $60. 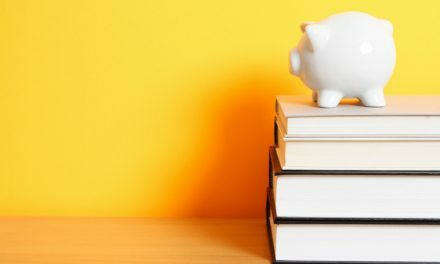 Debitize will deduct the cost of those purchases from your connected checking account and transfer it to your Debitize Reserve Account. Then, about a week before the bill is due, they’ll automatically make the payment for you. Do I need a special card to use Debitize? No. Debitize does not provide any type of card. Just connect the credit cards you already have and use them normally. Do I need to worry about paying my own bills? No. Debitize pays your bills automatically. When you make a purchase with a connected card, Debitize deducts the cost from your connected bank account. Those funds are held in your “Debitize Reserve Account” and are used to pay your credit card bill about a week before it is due. Is my Debitize Reserve Account safe? Debitize does not mix your money with their general account. The funds in your reserve account are held on deposit in a regulated bank until they are needed. What about my financial information? Is it safe? With Debitize, money is only allowed to move between your bank account, your reserve account, and your credit card. No external transfers are available. Additionally, Debitize does not store your information. After your accounts are connected, the information is permanently deleted. They monitor your accounts and notify you of any suspicious activity, provide automatic logouts and ID verification, and you can unlink your accounts whenever you wish. For tech lovers, they also use bank-level 256-bit encryption that is monitored by Symantec. I want to pay off a purchase over several months. Can I do that? Yes. Should you wish to carry a balance, simply tell Debitize how much you’d like to pay toward the bill each month. Personally, I think this defeats the entire purpose of using Debitize… but hey, you do you. What if I there’s not enough money in my bank account to pay for a charge? Debitize allows you to set a minimum balance so you will never overdraft. Charges taking you below your minimum balance will not be debited to the full amount. You’ll get an alert once you hit the balance, and you’ll need to make a deposit in order for Debitize to continue making withdrawals. If you’re somebody who wants to earn credit card rewards but is nervous about debt, Debitize could be an excellent solution. By allowing your connected credit cards to act like debit cards, Debitize helps you take advantage of credit card perks without the downside of debt. By changing your settings, you can pay extra toward existing debt or carry balances, if necessary. Personally, I love the concept of Debitize. If you’re into pursuing travel rewards, I definitely think you should check it out. I hope you’ve enjoyed this Debitize review. Let me know what you think in the comments below! Get $10 With New Accounts – Thinking of opening a FREE Debitize account? Use this link and get a $10 credit toward your first credit card bill! True, but that’s where people fall through. I think the other benefit is that you can see where you’re at all in one place. 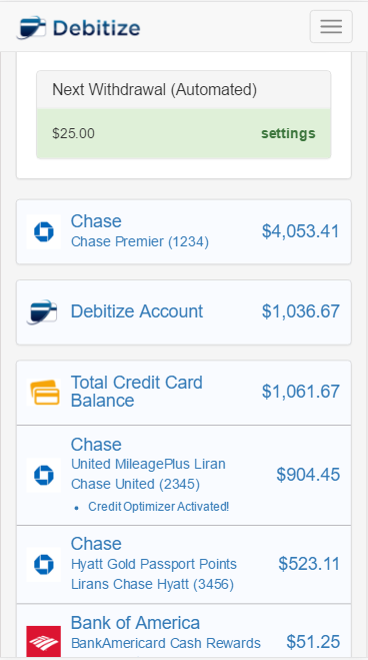 Because the app deducts the cost of each credit card purchase from your account as you go, you aren’t “suprised” with a bill of $3,000 at the end of the month and only $1,000 in checking to pay for it. I really like the idea of this! As someone who absolutely doesn’t trust myself with credit cards, this takes all of my concerns and takes care of it for me. I wouldn’t recommend it unless you’re already complete debt free, however. But that’s just my opinion. Once I’m out of debt, I think I’ll have to give this a try! Lisa, I think this app would actually be perfect for somebody like you 😀 And I agree, I’d steer clear of credit cards completely unless you are debt free. I use my online banking. Pay my bills in full and on time each month. All of my credit cards earn me a cash back bonus. I don’t travel so I don’t need cards that earn me miles. My FICO score fluctuates between 802 and 816. I think that is pretty good for a single Sr. citizen living on an extremely low income. What is the upside for the app developers? Do they earn interest on the money held in the reserve account? I don’t know for sure, but I’d imagine that is it. How does Debitize make money? There you go! At the moment, I’m fairly certain they are funded by angel investors and venture capital. But, that pretty much tells you how they’re planning to make money in the future. Feels like there are so many different apps out there now. It is getting harder to innovate with financial technology. Anyway, Debitize deserves a test run.